Gaming fans everywhere rejoice; the long-awaited "Warcraft" movie has arrived! 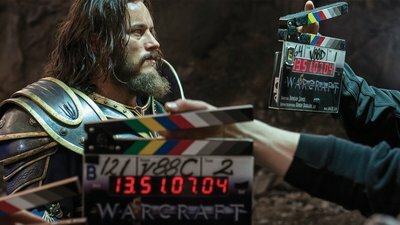 Find out how Travis Fimmel transformed himself into Lothar, the "Lion of Azeroth." With his rugged Scandinavian good looks, chiseled physique, and arctic blue eyes, 36-year-old Travis Fimmel has starred opposite the likes of Adrien Brody, Woody Harrelson, and Patrick Swayze, but he truly gained worldwide attention as power-hungry Ragnar in The History Channel's hit TV series, "Vikings." Now he's starring in the $100 million epic "Warcraft" movie, a live-action adaptation based on the video games of the same name. Here's how Fimmel—who played for the Australian St Kilda Football Club and modeled for Calvin Klein—took advantage of his athleticism and fine-tuned his physique to portray these two powerful warriors. Fimmel is said to have beat out a host of other A-list stars—including Colin Farrell— to land the role of Sir Anduin Lothar in "Warcraft." The adapted blockbuster might have flown under the radar so far, but the "Vikings" actor is sure to see his star rise even further when the movie is released on June 10. Portraying the knight champion came with its own set of unique challenges, particularly when it came to donning his epic Azerothian armor. "The costumes and effects were interesting," Fimmel says. "It took four people to help put on my armor, and three to take it off. Walking through doors wasn't easy. Most of the time, I'd have to turn sideways." Maneuvering in lothar's armor and performing scenes in front of a blue screen was challenging for fimmel, but moviegoers will be impressed with the onscreen results. While acting in front of a blue screen was also difficult at times, Fimmel believes the effects are going to blow audiences away. "Doing action scenes wasn't the easiest. Everything from the weapons to the horses were oversized," Fimmel explains. "It wasn't a typical performance, because a lot of it had to be mapped out. Logistically, you always had to be aware of the CGI and motion capture. Some of the footage amazes me, especially after seeing the finished product where the former big, blue screen was replaced with detailed vistas and flying creatures." That's the stuff successful summer blockbusters are made of, and you can bet gamers will be taking a break from their consoles and computers to get an eyeful. However, the plot of "Warcraft"—which isn't as black and white as you might expect an action movie to be—has a lot to offer audiences who aren't familiar with Warcraft lore. The concept of "good versus evil" is treated with a surprising degree of subtlety. "In 'Warcraft,' there are two major parties, and neither of them is really right or wrong," Fimmel explains. "There's no typical bad guy. It's interesting and very sympathetic; you understand both sides." As a natural sportsman, Fimmel loves nothing more than to roll up his sleeves and execute his own fight sequences and stunts. Fimmel's years on "Vikings" undoubtedly helped with "Warcraft"—especially when it came to weapon movement and training. While the fighting style in "Warcraft" is more stylized that the raw brutality of "Vikings," it offered its own challenges. "'Warcraft' is very motion-capture and special-effects oriented," Fimmel says. "We did more choreography, but with both shows, it's all about planning and working with the stunt coordinators." Fimmel comes from humble beginnings, and his nutrition reflects that. "I'm a farm boy, and I lead a healthy life," he says. "I love the country, fishing, walking, camping, trees, all of that. I keep in shape by drinking whiskey instead of beer, and I love my steak and veggies." "Warcraft" promises all the elements of a summer blockbuster, and gamers are sure to head to the theater to get an eyeful. But when it came to portraying a Nordic warrior on "Vikings," Fimmel was ruthless with his nutrition and serious about slashing weight—so much so, in fact, that he actually began following a Nordic diet. Staples of this diet include fish, steak, and vegetables, and the plan shuns white bread and pasta. Both Viking and Azerothian warriors need big, strong arms to row the choppy seas and sling their heavy weapons around during battle. Whether you're looking to target your biceps or tear down your triceps, we've got a killer workout for you. Swinging sword and axes convincingly for hours on end requires a serious arm workout. Authoritative exercise and eating plans direct from the world’s top trainers, professional athletes, and movie stars.